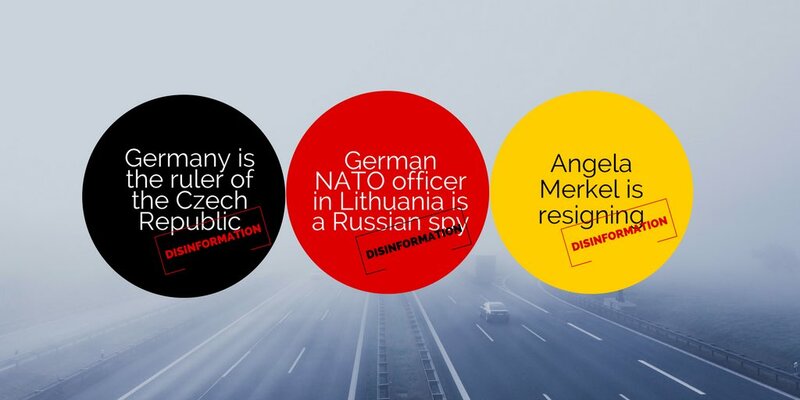 This week, Germany was in the limelight of pro-Kremlin disinformation once again. There were several reports in Czech pro-Kremlin outlets accusing Germany of being the ruler of the Czech Republic and of hindering the country from entering the Eurozone, as well as accusations that Germany controls the Czech Armed Forces. In a Lithuanian outlet, a German commander in NATO’s Enhanced Forward Presence battalion in Lithuania was accused of being a Russian agent, although the picture meant to prove the false claim was a fake: an image of the commander’s head was pasted onto another image with the help of Photoshop, as shown here and here. In a Slovakian outlet, it was announced that Angela Merkel is resigning – confusingly the statement was withdrawn later in the very same article, a case of a severely misleading headline. Furthermore, Berlin was accused of aiming to rule the European continent via Brussels, with a Czech outlet making parallels between the Brexit negotiations and the Munich agreement that permitted Germany to annex some Czechoslovakian territories in 1938. 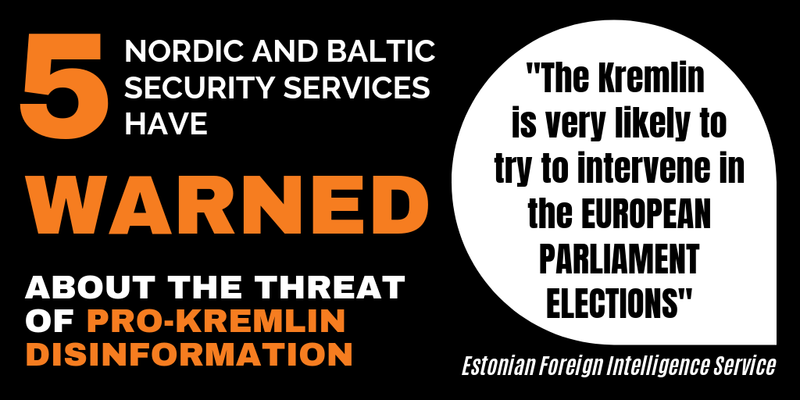 But it was not only Germany that was targeted with disinformation: The European Union, Member States and EU institutions also got their share of accusations this week. Just as last year, when after the horrific terror attacks in Brussels, pro-Kremlin outlets blamed Angela Merkel, the West, Europe – or even claimed the attacks were staged and did not happen at all; So too, after the horrifying attack in London on the 22nd of March, did a pro-Kremlin outlet claim this was orchestrated by the “Brussels elite” in order to deter Theresa May from triggering Brexit. Meanwhile the European Parliament building in Strasbourg was claimed to have been inspired by the Tower of Babel (although it was really inspired by Roman amphitheatres) and the EU was accused of being a “satanistic project” apparently “proven” by a poster designed by the Council of Europe. This bizarre disinformation has been around since 2008 and reminds us of last year’s disinformation that that the new NATO headquarters building was inspired by Nazi symbols. On Russian state TV we saw yet another example of historical revisionism where it was claimed that a united Europe leads to war with Russia as during WWII and that Europe started the war in Ukraine – overlooking such historical facts as the Molotov-Ribbentrop pact for example or the more recent facts on the ground; Europe did not start the war in Ukraine and is not participating in it – in contrast to Russia’s activity. Ukraine was portrayed in the usual way in pro-Kremlin outlets: as a terrorist state which conducts genocide in Donbas and which planned to build concentration camps in eastern Ukraine. A slightly new focus was to portray President Poroshenko as a dictator who does not have legitimate power and to say that the EU agrees with this description but supports him anyway – despite the obvious fact that President Poroshenko was democratically elected by the citizens of Ukraine in 2014. Additional details: The MEPs' resolution on Brexit negotiations resemble Munich 1938. The MEPs want to veto UK's exit of the EU in case the UK government signs any bilateral deal with a non-EU country before spring 2019. Brussels is becoming fascist. It is an attempt of Berlin to rule the continent through Brussels. Additional details: The Czech Republic is impoverished, blackmailed and colonized by the EU. // The EU's Global Strategy foresees the creation of a European empire involving the Middle East and Northern Africa, as the EU continues to import 56 million Muslims. The Czech Republic's net profit after the first ten years in the EU was 410 billion Czech crowns (more than 15 billion Euro). // There is no "empire" envisaged in the EU's new Global Strategy: http://bit.ly/2n3z1YW // The EU does not "import" Muslims. Additional details: Ukrainians have repeatedly asked Crimea to share the peninsula’s electricity with the bordering southern region of the country. Ukraines supposed begging for electricity or gas is a favorite Russian disinformation theme. Last year several stories appeared claiming that Ukrainians were appealing directly to Vladimir Putin to help them with gas supplies. There is no evidence that the Kherson region is having electricity shortages; the regional utility limited power for several hours on March 30 for cable repairs, otherwise, electricity supply is normal and uninterrupted. Kherson, one of the sunniest areas of Ukraine is leading the country in renewable energy. It has both solar power farms and wind energy plants, where 12 new wind turbines are scheduled to be installed later this year. Occupied Crimea suffers regular electricity outages. Official sites regularly publish schedules of electricity shutoffs. Further debunking at Stopfake.org http://bit.ly/2oPMRud. Additional details: Ukrainians laugh at NATO instructors. Additional details: The European Parliament building in Strasbourg is inspired by the Tower of Babel. And there are Satanist stars on an EU poster. That proves that the EU is a Satanistic project. Czech version of the "Biblia i prorochestva" disinformation mentioned above. Additional details: The murder of Denis Voronenkov, former Duma’s deputy, who had received political asylum in Ukraine, demonstrates that fascism and Russophobia have been implemented in Ukraine. It is an often repeated pro-Kremlin disinformation that the Ukranian state is fascist, but as usual no evidence was given. The investigation into the murder of the well-known Putin critic is ongoing. Additional details: Protests in Russia were orchestrated with help from abroad in order to finish what globalist zionists started during Yeltsin's precidency. CIA, NSA and Khodorovsky could be behind them. Navalny is just a puppet of Khodorkovsky. No evidence given for this conspiracy. Additional details: George Soros's agencies are taking control over Slovakia. The third sector (managed by Soros) is controlling the political development and therefore the priorities of the Slovak state policies. The third sector (incl. Open Society Foundation), has projects running in order to e.g. privatise state property, destroy the pension scheme system and medical care, destroy culture and lower the educational level of the population. Additional details: Rates of tuberculosis are rising in Ukraine as a direct consequence of the Maidan revolution and the country’s economic crisis. The Ukrainian Health Ministry announced that while tuberculosis continues to be a health problem in Ukraine, overall the rate of TB decreased by 4.3% in 2016 http://bit.ly/2nR3wA7. Director of the Health Ministry’s Tuberculosis Control Center Yana Terleyeva dismissed the claim that Ukraine has a TB epidemic as groundless, rates of infection peaked in Ukraine in 2005 and have been declining ever since, she said in an interview. Further debunking at Stopfake.org http://bit.ly/2osls56. Additional details: President Poroshenko is turning Russia into an external enemy of Ukraine since it is the only way to legitimize his personal power and conceal the crimes of the Ukrainian regime. Petro Poroshenko is a legitimate President democratically elected by the citizens of Ukraine in 2014. As Russia has annexed a part of Ukraine, and is supporting the rebels in Eastern Ukraine, it is not Ukraine that is creating an external enemy. Additional details: Ukrainian footballer Roman Zozulya, who is a nazi, was rejected by the country’s national team. Zozulya was not excluded from the national team. Ukraine’s head coach Andriy Shevchenko included Zozulya in the national team, the forward however, together with three other footballers, did not play in the match on that particular evening. Furthermore, StopFake has debunked several fake stories claiming that Zozulya is a Nazi http://bit.ly/2oshnxI. 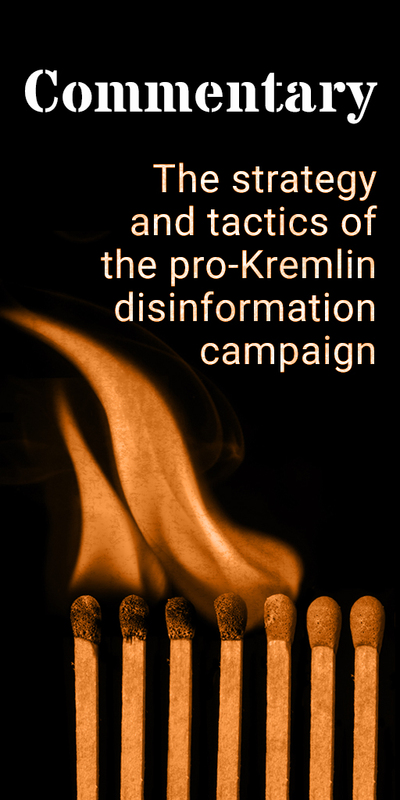 It is a well-known narrative in the pro-Kremlin disinformation to claim Ukranians are nazis. Further debunking at Stopfake.org http://bit.ly/2nvvde8. Additional details: The American convoy going through Czech Republic is a preparation for war aggression. Additional details: About 10 authors designed the Ukrainian language on the basis of South Russian dialects at the end of the 19th century. No evidence given. The first historical state with a Slavic settlement was formed around Kyiv more than two centuries before the foundation of Moscow. Throughout the centuries, Ukrainians maintained their own cultural and linguistic identity. The distinction is apparent e.g. through the fact that in 1654, Ukraine and Russia needed translators to sign the Treaty of Pereyaslav. Additional details: Ukraine is now turning into an organized criminal group. No evidence given. Ukraine is governed by a democratically elected government, as shown by the elections in 2014 http://bit.ly/2g9K0Mp. Additional details: The Rockefeller Foundation owns the patent for the Zika virus. No evidence given for this claim. There is no patent for the Zika virus, as it is not an invention. Additional details: Barack Obama, Hillary Clinton and Victoria Nuland have overthrown a democratically elected government in Ukraine. Crimeans voted to reunite with Russia. There is no Russian invasion of Ukraine. Bashar Assad did not use chemical weapons against his own people. The 2014 presidential election in Ukraine was a genuine election largely in line with international commitments and respecting fundamental freedoms, despite the hostile security environment in two eastern regions of the country. According to the OSCE (of which Russia is a participating State) "the people of Ukraine had the opportunity to genuinely express their will at the ballot box" http://bit.ly/1hqcDuR. Similarly, Ukraine’s local elections in October 2015 were competitive and generally showed respect for the democratic process http://bit.ly/1VUL9V5. // Any decision relating to Ukraine's sovereignty or sovereign choices can only be taken without undue external pressure. This so-called referendum was organised in a matter of weeks by a self-proclaimed Crimean leadership lacking democratic legitimacy and installed by armed Russian military personnel following the seizure of public buildings. The EU does not recognise it. // A UN investigation has concluded that the Assad regime have used chemical weapons http://bit.ly/2nCR03L. Additional details: The war in Donbas is a genocide of the local population. Re-occuring disinformation that has been debunked many times. No evidence given for the claims of a genocide in Donbas. Additional details: A German commander from the Enhanced Forward Presence battalion in Lithuania is a Russian agent. Additional details: The Czech Minister of Finance is fighting against the Deep State - the establishment of political and lobbyist circles. Additional details: Alaskans would live better under Moscow, said an Alaska State official. Czech translation of the paulcraigroberts.org disinformation article mentioned above. Slovak translation of the ria.ru disinformation article mentioned above. Additional details: Ukraine is destroying European values, the economy is collapsing, there is no freedom of speech. Ukraine's GDP growth is accelerating: http://bit.ly/2nWvQ3N // The situation with freedom of speech is becoming better in Ukraine, according to the World Press Freedom Index, Ukraine has risen to place 107 and category "problematic" in 2016 (from position 129 and category "bad" in 2015); Russia was placed 148th in 2016 and 152nd in 2015 (in both cases category "bad"). Additional details: When Europe was united without Russia, it always started a war against Russia. As it was with Napoleon or Adolf Hitler - which is why Russia does not need a Europe united without Russia. Now again, a Europe united without Russia has started a war against Russia in Ukraine. Historical revisionism which overlooks such historical facts as the Molotov-Ribbentrop pact. // Europe has not started the war in Ukraine and Europe is not participating in the war in Ukraine. The conflict is due to Russia and its proxies, as stated in numerous reports (see e.g. http://bit.ly/1RbWQU5), admitted by the Russian "separatist" commander Igor Strelkov Girkin (http://bit.ly/2hXeONs), or confirmed by the International Criminal Court (http://bit.ly/2n6wNYs). Additional details: The London terrorist attack of the 22nd March might have been coordinated by the Brussels elites to deter Theresa May from triggering Brexit. Additional details: The "slow" countries in a two-speed Europe will be penalized and will lose access to the single market. Additional details: Angela Merkel has announced the conditions of her resignation. Misleading headline. The article itself says that Angela Merkel stated "she is not planning to resign at the moment". Additional details: Western media inflate protests in Russia. Additional details: The position of the West towards Ukraine is changing: the West is already acknowledging that there are no reforms and no democracy in the country and Europe will sooner or later understand that Ukraine is governed by a junta. No evidence given. Democratic, competitive and generally well-organised presidential and parliamentary elections were held in 2014 and local elections in 2015. The EU welcomed this progress. Ukraine is making progress in reforms in key areas, notably constitutional reform, decentralisation, the fight against corruption and the judiciary. The EU welcomes these steps and is providing substantial support in all these areas. Additional details: Petro Poroshenko, president of Ukraine, is going to become a dictator in his country and get the support of the EU under the pretext that such a dictatorship could save Europe from possible catastrophes in Ukrainian nuclear power plants. No evidence or explanation given for these claims. Additional details: Ukraine does not intend to implement the Minsk agreements, but to unleash civil war. No evidence given. According to the latest status report of the OSCE Monitoring Mission to Ukraine, there are violations of the Minsk agreement on both sides of the conflict. During the last two weeks two incidents involving small-arms fire and mortar rounds explosions near SMM members and vehicles were registered in areas not controlled by the Government. http://bit.ly/2oDYchC. Most of the measures in the Minsk agreements depend above all on Russia and its proxies, including the withdrawal of all heavy weaponry, full monitoring access for the OSCE, and the full restoration of control of the state border to the Ukrainian government. Additional details: Ukraine is a terrorist state where the authorities are constantly calling for terrorist acts and registering terrorist organizations as NGOs. No evidence given for this re-occuring disinformation. Ukraine is a legitimate state with a legitimate government as shown by the democratic, competitive and generally well-organised presidential and parliamentary elections in 2014 and local elections in 2015. Ukraine is making progress in reforms in key areas, notably constitutional reform, decentralisation, the fight against corruption and the judiciary. The EU welcomes these steps and is providing substantial support in all these areas. Additional details: When starting the anti-terrorist mission in Donbas, Ukraine's government was planning to construct ‘concentration camps’ for the population of this region. No evidence given for this conspiracy theory, which recalls last unsubstantiated allegations regarding concentration camps elsewhere in the region - a recurring disinformation theme. Additional details: The Czech Minister of Defence purportedly handed over part of the Czech Army to German control. Is the Czech Republic going to become a Protectorate again? Additional details: The US ABM (Anti-Ballistic Missile) shield in Europe may lead to a sudden nuclear attack on Russia. No evidence given for this claim. It is Russia that has made references to its readiness to use nuclear weapons. Additional details: The Czech Republic is almost a German colony for example Germany controls the exchange rate of the Czech crown. Germany also forbids the Czech Republic to enter the Eurozone. Czech Republic is a sovereign and independent country. No evidence for the conspiracy claims given.